Ancient Wonders are an heritage from your ancestors. They were great architectural magical structures that served different purposes: some were a source of extra knowledge, others increased the power on training and fighting techniques, others were source of a high cultural conscience, some others were a symbol and incentive for the union between races and others were even a channel to enhance the power of the magic relics, increasing production boosts. 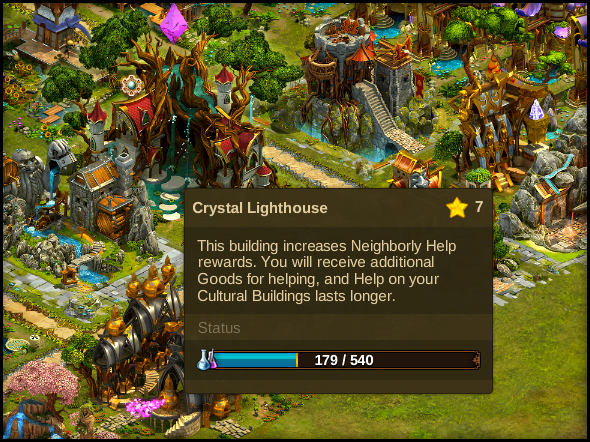 Having them in your city will allow you to have all those different bonus and will help you to develop your race even further and take your city into a higher prosperity level! Each base race (Humans and Elves) will have the opportunity to build several Ancient Wonders that can be found in the different game chapters. Each Ancient Wonder will provide you with something unique! It can be a portrait you can use in your player profile or a counterpart to embellish your city! To be built Ancient Wonders require the research of the correspondent technology and resources. They need a street connection to the Main Hall to be activated. You can only build each Ancient Wonder once, but they can be upgraded, sold and rebuilt! To build your first Ancient Wonder you first need to research and activate its corresponding technology. By doing so, you will also unlock the Ancient Wonder Menu, represented by a Rune Circle Icon that will be a part of your Main Menu (just like the Trader, for example). Hovering your mouse over the Ancient Wonders Icon will show you the amount of Runeshards you actually have for all Ancient Wonders including the amount of Broken shards. 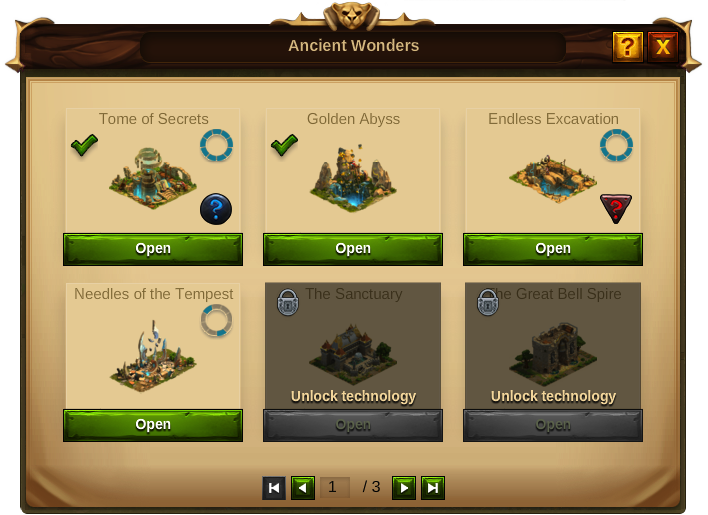 By clicking on the Ancient Wonders Icon, you will have access to the Ancient Wonders window where you will be able to navigate through all Ancient Wonders: The ones you have researched, built and the ones still locked. 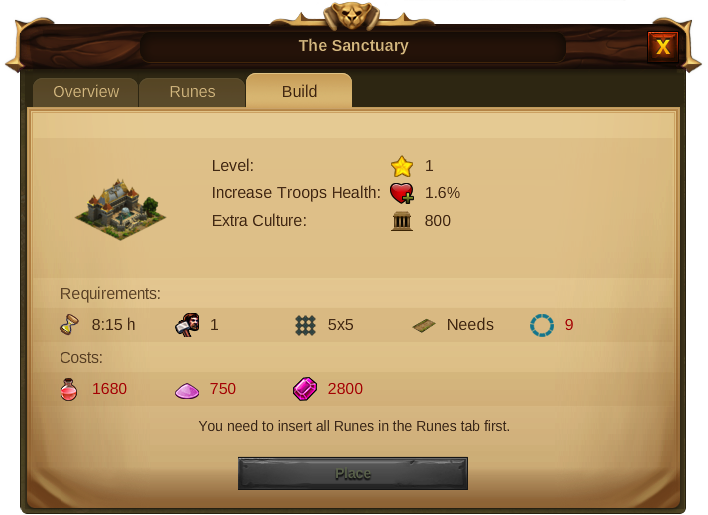 As an overview, you will also be able to see the progress on your activated Runes and the matching Rune Shards to each Ancient Wonder. By now, you will know that the Rune Circles you recently discovered are not complete! Their Runes were shattered and are missing some parts... those parts - The Rune Shards - are still lost and you need to find them in order to complete the Circles! Only by fully activating the Rune Circle with 9 magical Runes will you be able to build an Ancient Wonder. But this process will only be possible if you collect the missing Rune Shards, insert them in the Circle and activate the Runes. That means your first step will be to collect the Rune Shards! Each Ancient Wonder is attached to a specific Rune Shard. 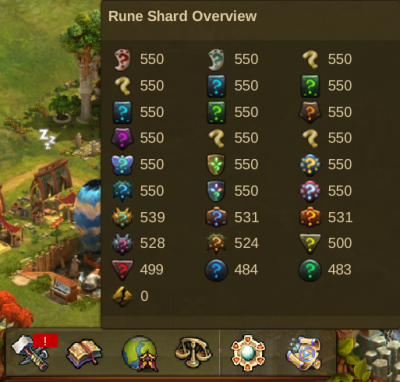 You can see which Rune Shard belongs to each Ancient Wonder on the Overview panel. 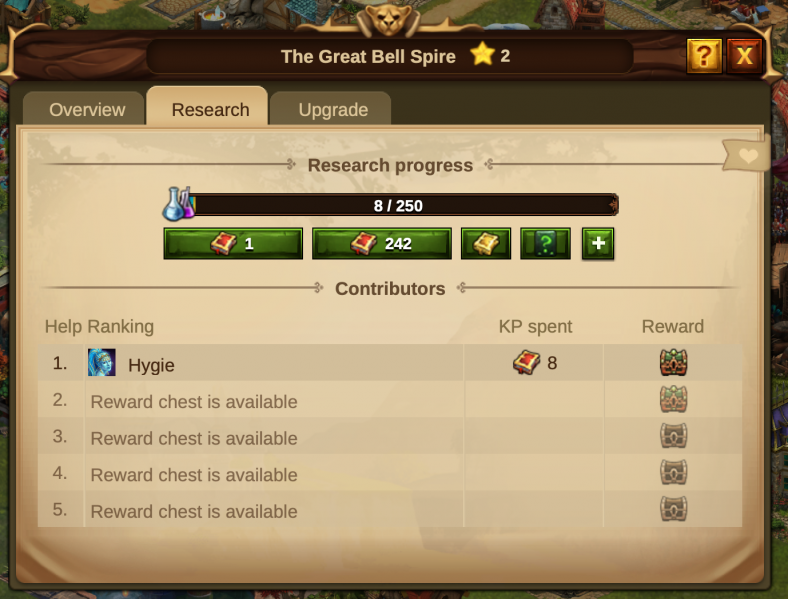 By Investing Knowledge Points in other players' Ancient Wonders. After collecting a Rune Shard, you need to insert it in the Rune Circle of the relevant Ancient Wonder. With a bit of fortune, it will activate one of the missing Runes within that Circle and reveal it. However, in some cases, the magic process will just try to reveal a Rune which has already been activated and in this case your Shard will break even more. But not all is lost! Your Broken Shards will be kept and once you have collected 10 of them, you can forge them into a new unrevealed Rune. Hint:Broken Shards can be used to reveal all kinds of Runes in any Ancient Wonder! So if you still have them after building one Ancient Wonder you can use them to forge and activate a Rune in a new one! As explained, building an Ancient Wonder is a 3 steps process: Research its technology on the tech tree, activate the 9 runes and pay the required Goods. 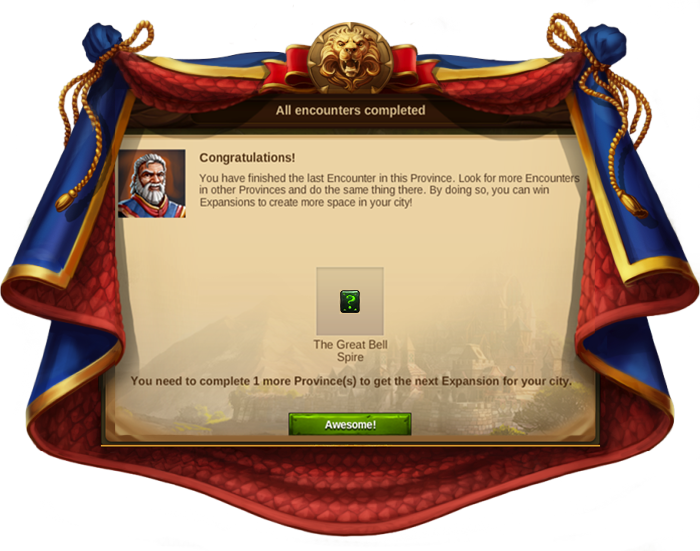 Once an Ancient Wonder is placed in your city, its bonus is immediately activated for your city in level 1, but you can increase those bonus by upgrading the building up to level 25. 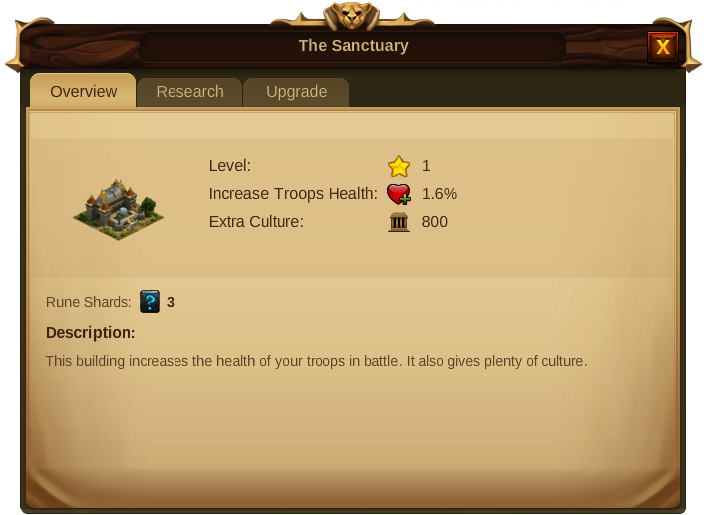 Upgrading from level 1 to level 5 will require 2 steps: the research of the level and the use of Relics to complete the upgrade. If you click the on the Ancient Wonder you will now see 3 Tabs: Overview, Research and Upgrade. 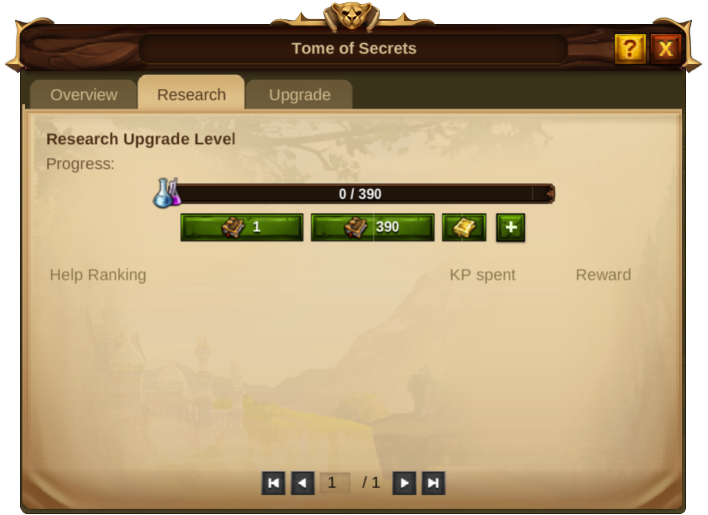 The Research tab will show you a Knowledge Points progress bar, similar to the ones in the Tech Tree. 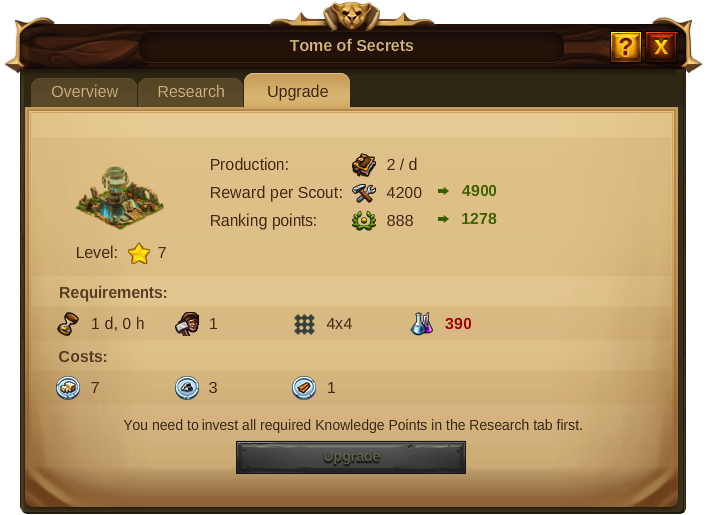 You will then be able to invest the required Knowledge Points and see the list of players who are helping you to research the upgrade level. 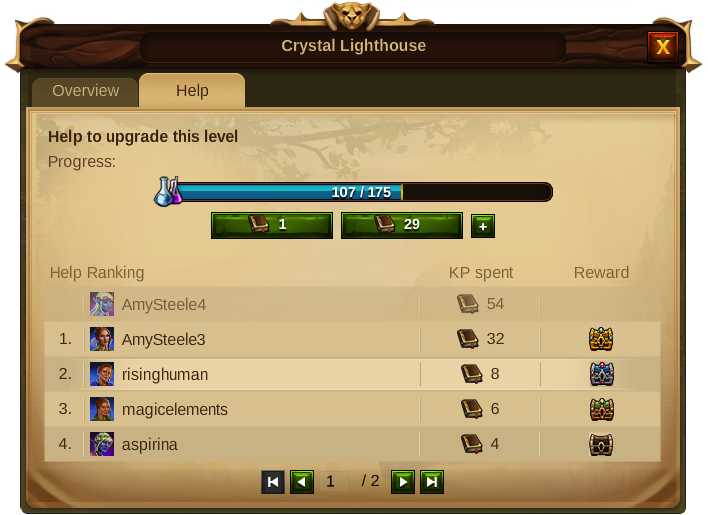 Once the bar is full you will need to go to the upgrade tab and finish the upgrading process by using Relics. Hint:The amount of the different required Relics for each upgrade differs according to your boosted type! You can see the required amounts for your boosted Relics type on each building information table. 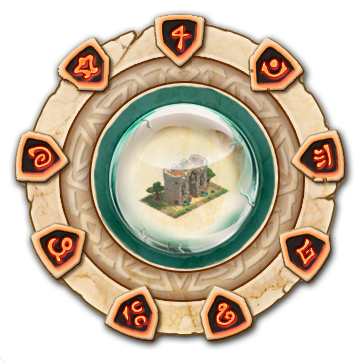 To upgrade any Ancient Wonder to its level 6 you will face a new Rune Circle that requires 9 new Runes to be revealed and activated as the architectural magic of your ancestors takes a new turn! After this, from level 6 to level 10, the Ancient Wonder will again need Knowledge Points investment and the mix of the magic relics. The full process repeats itself in the following Ancient Wonder's levels. Hint:The Relics required for the Ancient Wonders upgrades are removed from your Relics inventory. That means that when you use your boosted Relics, you will probably loose a small percentage of your production boost. So be sure to have plenty of Relics and keep collecting lots of them, that way you can easily afford or compensate the loss of production boost when upgrading an Ancient Wonder. Hint:By upgrading your Ancient Wonders you will also get Ranking Points! These correspond to the Knowledge Points invested per level. The ranking Points are added only after the building upgrade is completed! It is possible for players to help each other with the upgrades of Ancient Wonders! 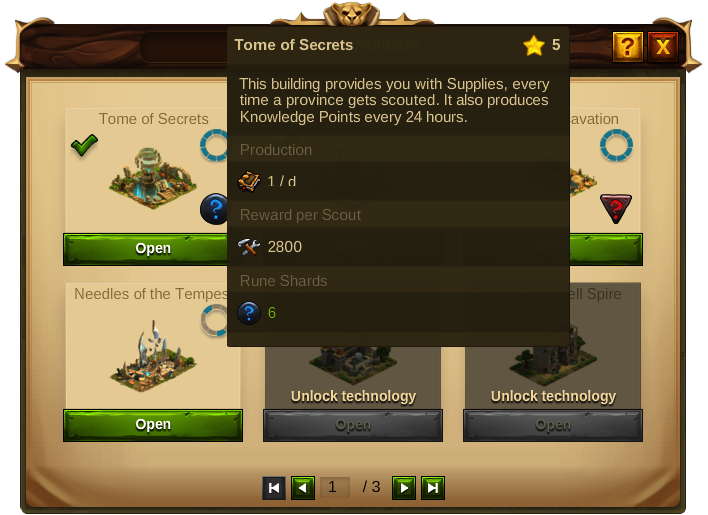 For that all is needed is to visit a player, click on the icon over the Ancient Wonder, select the help tab and invest the desired Knowledge Points. The top players on the helping rank will be rewarded for their investment and will get Rune Shards and/or Knowledge Points! 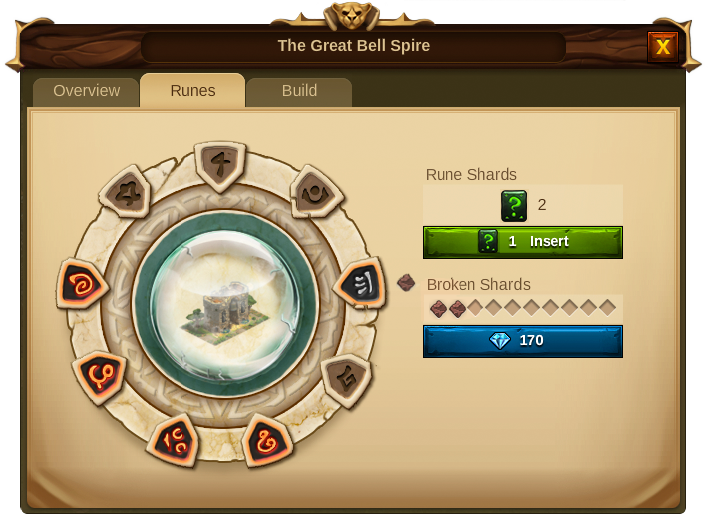 Remember that even if your Ancient Wonder is built you will still need another set of 9 revealed Runes to upgrade it to other levels, meaning that this is an alternative to gaining them through completing Provinces. As said before, Ancient Wonders are a great way to promote players engagement with each other regardless of the chosen race. Humans can invest in Elven Ancient Wonders and vice versa, because they will receive Rune Shards for the Ancient Wonder of their own race that has the same effects as the one they have helped. For example, if you are a Human and want Rune Shards for your Great Bell Spire, you can invest in the Elven Crystal Lighthouse. Only the top helping players that have helped another Ancient Wonder will be rewarded. The amount and content of the rewards depend on the Ancient Wonder level. You do not get rewards for investing in your own Ancient Wonders. You will be shown in the Helping Rank but with no reward icon. For example, if the owner is in the first place of the helping ranking, the first reward will be granted for rank position 2 and so on. 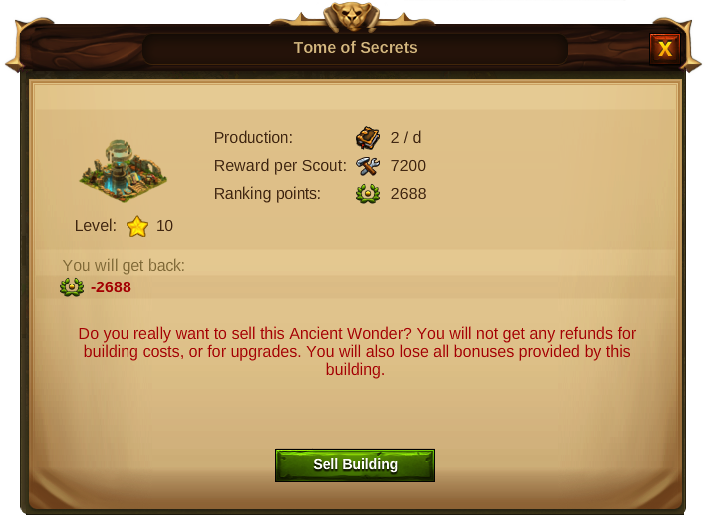 Ancient Wonders can be sold, but be very aware that if you decide to do so, your city will lose all its bonus related to that building and will not get any resources back.